A couple of weeks ago, I posted about a bag of vanilla beans I bought on Amazon. These beans had an extremely high water activity when they arrived, something I’d been expecting since reading a few negative reviews on Amazon where customers complained of mold. At a level of 0.98, I was pretty sure they would mold if left at room temperature in a zip lock bag (as instructed by the manufacturer). I thought that drying the beans out would keep them from molding. That much turned out to be true. The drying took quite a bit longer than I anticipated, and although I only got down to a water activity of 0.88, I assumed that the combination of water activity and alcohol the beans were soaked in would be enough to prevent mold. Again, this has so far turned out to be true. I returned the beans to a zip lock bag. A couple of weeks have passed since then, and I haven’t seen any mold in my dried beans. Here’s where things start to turn weird, and a little fishy. I still had a key question that hadn’t been answered: why were my Costco beans dry while these ones were wet? I decided to research how vanilla beans are typically manufactured. Turns out, this is a complex process that can be explained in about 9 minutes by a helpful lady on YouTube with an exotic latin accent. 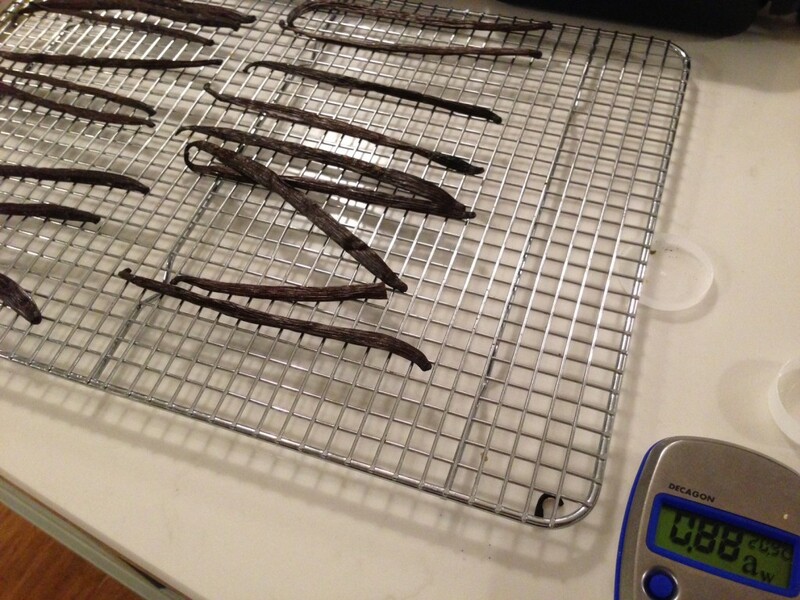 When it’s finally done, she claims that a dry vanilla bean will last for 50 years if stored in a sealed glass container. I agree with her. The vanilla beans I bought at Costco lasted at least 7 years, and tasted as good last month as they did when I bought them. So why weren’t my Amazon vanilla beans dry when I got them? I grew even more suspicious when I made a batch of yogurt and used one of my now-dried vanilla beans to flavor it. As usual, I halved the vanilla bean, scraped out the vanilla “caviar” (the little black dots), and whisked it into the milk. I also threw the spent pods in to make sure they imparted as much flavor as possible. Yesterday, I started eating the vanilla yogurt, and try as I might, I can’t taste any vanilla. The little black dots do make for attractive window dressing, they just don’t seem to have flavored the yogurt. This is a clear contrast to batches I made with Costco’s vanilla beans last month, and even a batch I made last week with the wet Amazon vanilla beans straight from the bag. Seems all my vanilla taste had evaporated when I dried the beans so they wouldn’t mold. This leaves us with three possibilities. First, my taste buds are broken. I can test this hypothesis by doing some taste testing – not something I’m opposed to. Second, these vanilla beans are processed using a technique I’ve never heard of that results in a bag of beans soaked in alcohol. I’m not an expert in vanilla bean processing, so this is certainly possible. Third, these beans have been used to make vanilla extract, bagged, and then sold as virgin vanilla beans. When used in their “wet” state, enough vanilla extract could still be in the pods and caviar to deliver some vanilla taste, and nobody’s the wiser. I must admit, though, that even my “moldy” beans get 4.5 stars on Amazon. Customers don’t seem to be disappointed, except for the mold issue. I will now be forced to make multiple batches of vanilla-flavored products to test these possibilities. Ice cream, creme brûlée, brownies, vanilla sugar – I didn’t ask for such a heavy burden, but someone’s got to get to the bottom of this issue. Copyright © 2019 Decagon Devices, Inc. All rights reserved.